Our newest podcast guests Jon Patricios, M.D., the current president of the South African Sports Medicine Association (SASMA) and the 2015 Travelling Fellow of the American Medical Society for Sports Medicine (AMSSM). Dr Patricios is currently Director of the Morningside Sports Medicine Unit and a sports physician at The Centre for Sports Medicine and Orthopaedics in Johannesburg. He is a Fellow of the American College of Sports Medicine, the Faculty of Sports & Exercise Medicine (UK), and the International Sports Medicine Federation. Dr. Patricios has been a team physician to school, club, provincial and international sports teams in rugby, cricket, soccer, athletics and basketball. He is a member of the Cricket South Africa and SA Rugby medical committees and the Rockies Comrades Marathon Panel of experts. He is chief medical officer for the MTN Qhubeka cycling team and the Kaizer Chiefs Football Club; founder and Director of Sports Concussion South Africa; sports concussion consultant to World Rugby; and serves on tribunals for the South African Institute for Drug Free Sport. He has authored a case report on thoracic outlet syndrome in CJSM and is someone I have collaborated with on a talk focused on the use of social media by sports medicine clinicians, given in Orlando, Florida at the 2014 meeting of the American College of Sports Medicine. Somehow, among these many duties, he found the time to sit down for a chat, which you will find here in the podcast. Thanks Jon, and we’re looking forward to seeing you soon in Hollywood, Florida at #AMSSM15 ! Check it out: it’s free even without a subscription to the journal, for the time being. I am working on the podcast production phase of an interview I had with the lead author, William Roberts, M.D. ; the final product promises to be a lot of fun and will be broadcast soon. One of the subjects Dr. Roberts and I touched on in that talk was the potential value of the electronic evaluation, or ‘e-PPE.’ To whet your appetite for what is to come, why don’t you take the poll at the top of this post, and let us know if you use an e-PPE in your practice (in Ohio, where I practice, we just started using them with high school athletes this spring). Then, click on the link above to the study itself. Stay tuned for the podcast, and be sure to check out the entire new issue. November is here, and with it the promise of good things in the journal and on the blog. The Wimbledon Championships end tomorrow, with the Gentleman’s Singles Final pairing now set: either Novak Djokovic or Andy Murray will raise the Championship Silver Cup by day’s end, barring rain delay or marathon tennis match….. It has been another great fortnight of tennis, highlighted by Djokovic’s historic semi-final win over Juan Martin del Portro yesterday. 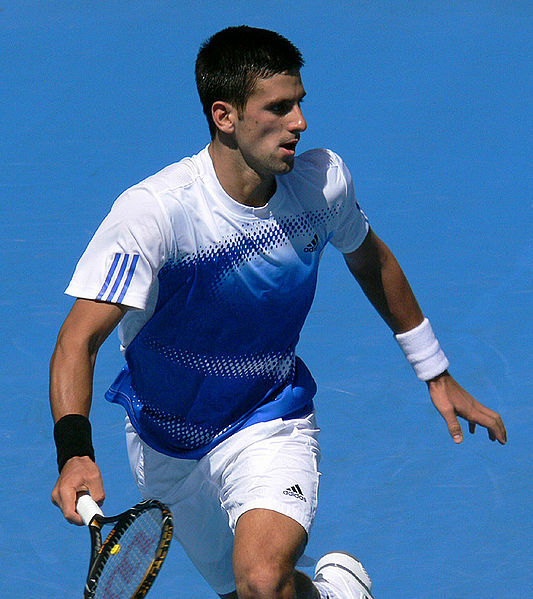 Djokovic seems to get involved in these epic five-set Grand Slam matches, having just been on the losing end of such a match at the French Open. His opponent that day, Rafael Nadal, was quoted as saying: “‘I learnt during all my career to enjoy suffering, and these kind of matches are very special….I really enjoy suffering.” This statement was given, mind you, by the victor! I remain impressed with Djokovic’s supreme athleticism and his ability to inflict suffering on others on the tennis court! It got me to thinking yesterday: what are the sources of his talents? Regular blog readers will recall previous posts describing a range of different anatomy applications for the iPhone and iPad, useful for both learning anatomy and for patient education. A particular favourite of mine thus far has been the 3D4Medical series of Apps discussed in a previous blog post, describing anatomy and pathology of various joints in the body, but these have not included an app designed specifically to cover just anatomy and pathology of the spine to date. Anatomate-Apps (anatomical animation applications) is a Australian Company founded in 2009 by Dr John Hart, in order to develop iTunes applications designed by clinicians involved in the assessment and treatment of patients with spinal conditions, for use as patient education tools. The over-riding idea is that patients who are given visual and spoken information in the form of interactive digital media during the consultation may experience an improved quality of care overall, as they are better informed about their condition(s) in a way that they can easily understand, and can then go on to make better informed decisions about their subsequent care. Whilst there are some patients and clinicians such as myself who undoubtedly welcome these applications for use during the consultation, there are other patients and clinicians who will prefer a more traditional approach. Nevertheless, it is hard to argue against the view that the use of applications designed for patient education on the new iDevices is likely to significantly increase in the future, and I for one am using these more and more in my patient consultations to good effect. iSpineCare is the first spinal anatomy and patient education application for iDevices that I have come across with such a comprehensive and accurate description of spinal anatomy and pathology. 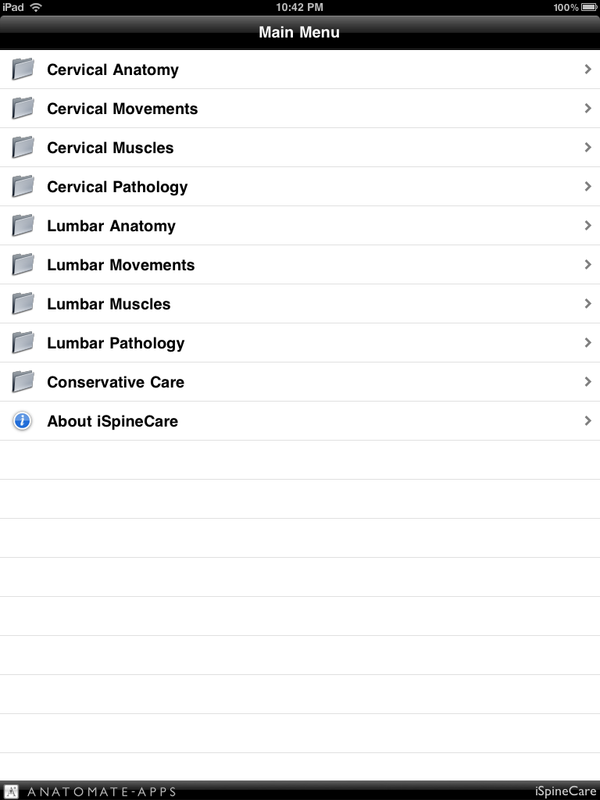 Constituting a hefty download at around 1.7GB of information on iPhone or iPad, the application consists of a main menu with folders relating to cervical and lumbar spinal anatomy, movements, and pathologies together with a folder of conservative care options and an exercise library folder. Navigating through the different sections is easy and quick, and takes you to a context-specific menu which contains links to a series of movies which can be paused, rewound, or fast-forwarded to different points of interest, together with an image library of key stills from the movies allowing for prolonged discussion around particular points of interest. In addition, a pdf document linked to each movie is presented giving a more detailed explanation of different topics. Another bonus is the availability of medical imaging alongside the individual movies. This section contains a series of x-rays, CT scans and MRI scans and has interactive labels and reports to help to explain the images further to patients. This section may also be useful for junior clinicians to assist with learning about spinal pathology from a visual perspective. 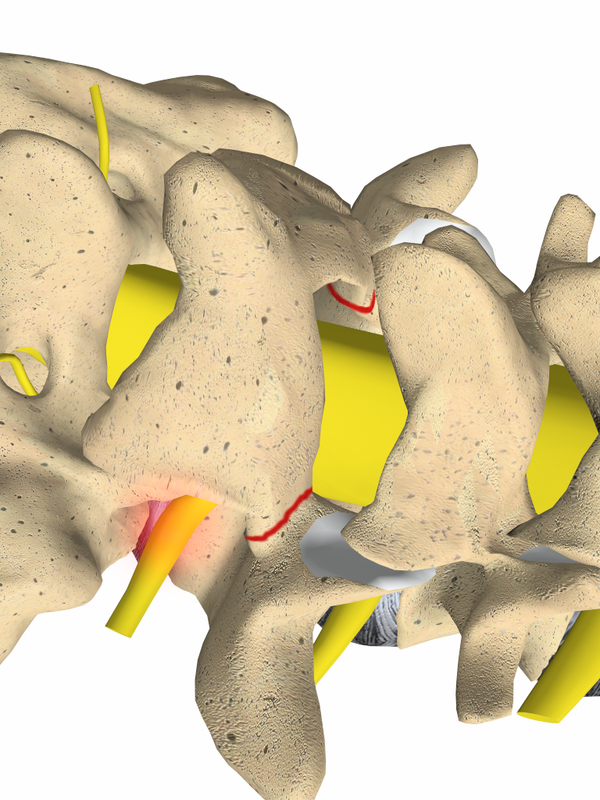 The quality of the images and in particular the movies is outstanding, with crystal-clear animations allowing for easy recognition of the relevant spinal anatomy and pathologies. Some of the movies have voice-overs explaining salient points, whereas others are animation-only allowing for the clinician to talk the patient through the particular points of interest important for that individual patient to be aware of and focus on during the consultation. In addition, there is a section where particular images can be added to a list of the user’s favourite movies allowing for quick access to a particular user’s most often-used animations. Another section of movies under the folder ‘Conservative Care’ offers a number of movies describing back-safe ways of performing everyday duties such as gardening, shopping and typing. There are also movies offering advice on a variety of lifestyle topics. Finally, there is an ‘Exercise Library’ folder with several sub-folders offering animations describing a series of exercises for different purposes including cervical flexibility exercises and core stability exercises. The overall package is very slick, well thought-out, and accurate in the descriptions of spinal pathologies and anatomical features. Stand-out points are the quality of the animations and the wide range of animations available. An internet connection is not necessary for the app to run, as all of the animations are downloaded embedded within the main app. Anatomate-Apps also offers other similar applications describing spinal surgery (iSpineOperations) and pain management (iSpinePainManagement), and there are some smaller-sized applications offering information focussed on some particular aspects of spinal pathologies and operations for those who don’t need the larger apps. As a Sport and Exercise Medicine Physician, I would have liked a little more emphasis on some of the conditions more commonly seen in my patient population including symptomatic spondylolysis, and cervical ‘stingers’ and ‘burners.’ However, most common pathologies are well represented and I can see iSpineCare and iSpinePainManagement becoming an important part of my clinical practice in the future. 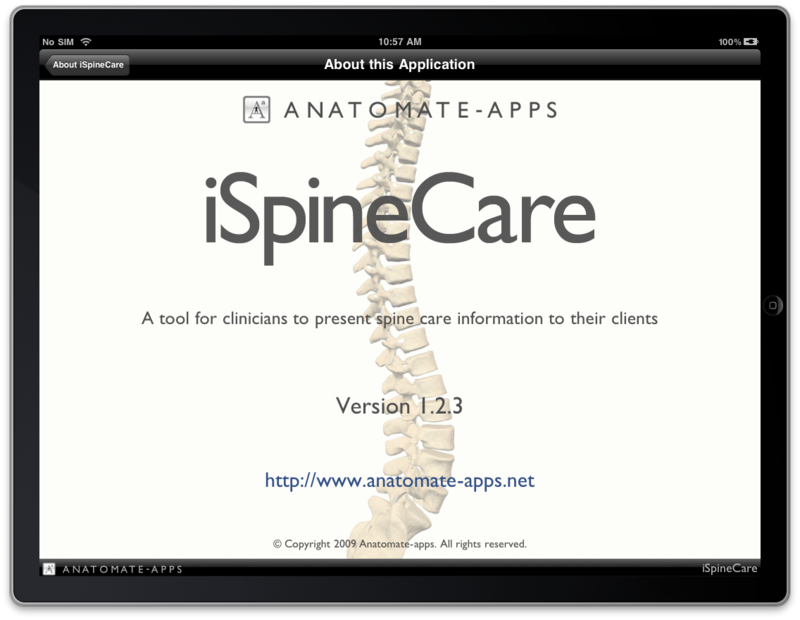 Anatomate-Apps are available on the iTunes Apps store, and a video review of iSpineCare highlighting some of its features is available from the App show iPad edition on the link below.